Dual Drive Bay Solution. 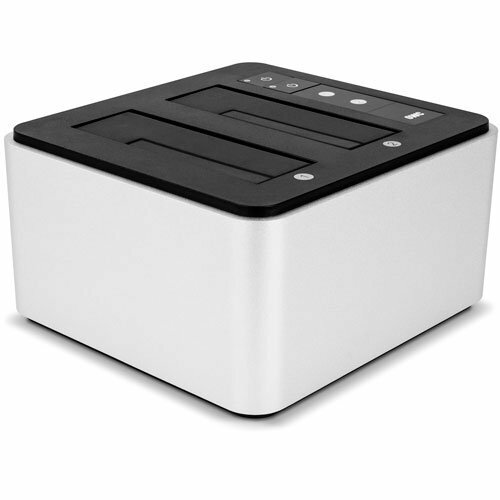 Mac / PC / USB 3.1 Gen 1.For Bare 2.5" and 3.5" SATA Drives. Drive Dock is the ultimate, high-performance bare drive access tool. For creative workflows, backup, or other tasks requiring constant access to multiple drives, Drive Dock delivers a compact, easy solution with the performance of a USB 3.1 Gen 1 interface. OWC Drive Dock is the easiest way to access bare SATA drives. Hot swap, read multiple drives simultaneously, or boot from bare drives, all at the speed of the USB 3.1 Gen 1 interface. For video and audio content pros working with multiple bare drives on big projects, Drive Dock delivers amazing flexibility and convenience, making it an indispensable drive tool. Drive Dock's unique design makes hot-swapping a breeze. Two drive bays accommodate both 2.5" and 3.5" drives and can access a drive in each simultaneously. Each bay features its own independent power switch and LED activity monitor. Drive Dock uses a USB 3.1 Gen 1 interface for versatile compatibility and an auto-switching internal power supply compatible with standard dual-prong power cables.Drive Dock is flexible enough to use on almost any system. It works perfectly as an on-location backup solution, or for creative professionals using multiple bare drives. Featuring rugged aluminum construction, quiet, fanless operation, and complete with a USB 3.1 Gen 1 cable, the OWC Drive Dock is an essential component to any high-demand workflow.Highlights:Two drive bays for 2.5" or 3.5" hard drives and SSDs,USB 3.1 Gen 1 connectivity,Up to 434MB/s speeds,Independent power switches, and simultaneous operation,Internal power supply with universal compatibility,Mac and PC compatible. Interface (Chipset): 1) USB 3.1 Gen 1 (ASMedia ASM1153E) (2) USB to SATA 6Gb/s Bridge: ASMedia ASM1153E, Drives Supported: 2) 3.5" SATA 6Gb/s drives or (2) 2.5" SATA 6Gb/s drives, Compressible Data: 434 MB/s Sequential Read,406 MB/s Sequential Write.